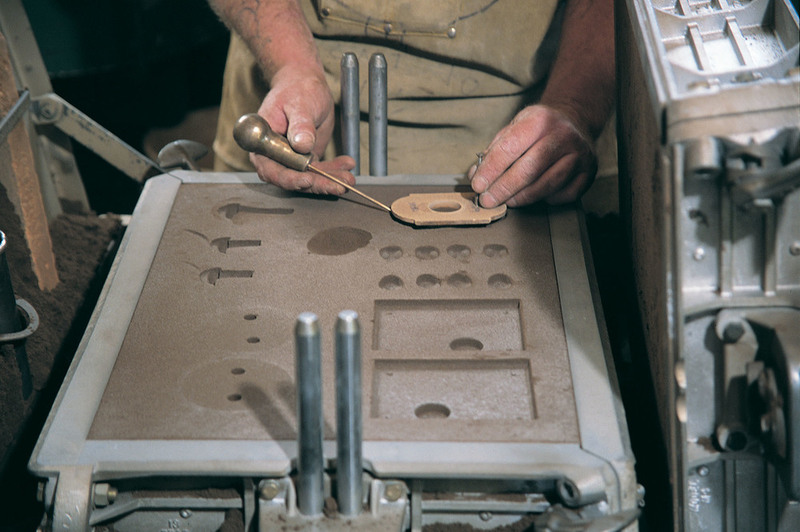 Sun Valley Bronze uses only the finest quality art grade bronze for consistent, high-quality castings. New ingots are transformed into architectural hardware. Scrap bronze from sand castings is recycled into subsequent castings, and even the floor sweepings are saved and sent to recycling centers. Patterns originate as an idea on paper. The design then begins to take shape traditionally using hard-carved wood or resin models, or digitally by implementing 3D modeling software. The furnace heats the bronze to a pouring temperature of 2250° fahrenheit. Precision machining ensures that every piece of Sun Valley Bronze hardware functions perfectly and meets our exacting specifications. Sun Valley Bronze hardware assembly includes stainless steel components and teflon coated springs for flawless function, and to ensure longevity in humid or coastal climates. Hand applied non-toxic patinas take the place of time and nature to oxidize copper and other alloys, giving the bronze a deep, aged look and feel. Sun Valley Bronze showrooms display a variety of styles and patina choices. Whatever your project, residential or commercial, it is easy to mix and match designs and finishes. Sun Valley Bronze has several internal material and assembly differences that make our hardware innovative, longer-lasting and of superior quality. Innovation in design, both aesthetic and functional, is what keeps Sun Valley Bronze an inspired and constantly evolving company. Precision machining and practical engineering ensure our products are of superior quality throughout. Sun Valley Bronze designs for longevity, using only the finest grade bronze for castings and stainless steel for internal mechanisms. All machining is performed on state-of-the-art equipment, capable of meeting tolerances to 1/10,000th of an inch, producing un-compromised quality and lifelong performance. All Sun Valley Bronze internal mechanisms are made of the highest quality stainless steel that will not corrode in humid or coastal climates. Not only aesthetically beautiful, bronze has the additional benefit of natural anti-microbial and self-decontaminating properties. Research has shown that copper and its alloys inhibit the growth of harmful bacteria. The development of copper alloy door handles, push plates and fixtures are now recommended by the Copper Development Association (CDA) for health care facilities and other institutions. Careful attention to detail makes our hardware FIELD REVERSIBLE and FIELD SERVICEABLE, setting Sun Valley Bronze apart in the industry. Our entry sets are interchangeable from active to dummy function and feature reversible handing. Sun Valley Bronze internal spring assists and limiters are made of the highest quality stainless steel that will not corrode in humid or coastal climates. Teflon-coated for smooth operation, our stainless steel springs are an integral part of the technical advances which ensure that Sun Valley Bronze hardware is built to last. Our revolutionary spring assist is so durable that it outlasted the cycle tester; the tester itself failed at 1.5 million cycles. This remarkable hinge incorporates innovative design, precision machining, and a stainless steel ball bearing, to create a low-friction, smooth operating hinge that is easily adjusted. A pair of matched hinge leaves are fitted around an adjustment mechanism and tension pin that allow vertical adjustment of either hinge leaf relative to the second hinge leaf at any time. Partial threading of the mechanism and tension pin prevents over-adjustment, thus protecting the structural integrity of the hinge. The stainless steel ball bearing, fitted between the hinge leaves, reduces friction and extends the useful life of the hinge. The hinge is easy to lift off by simply lifting upward. Long term performance is assured through meticulous design details. Sun Valley Bronze has the capability to make nearly any custom design envisioned for your project. Whether you have a sketch or a detailed drawing, our skilled pattern makers can help you reproduce your original design. Nearly 40% of our production is custom work. Sun Valley Bronze welcomes custom designs. We will try to accommodate any custom designs of door hardware or accessory items. Custom designs may incur design and/or pattern fees to be determined at the time of design approval. Please submit dimensional drawings and specifications of custom designs via fax, mail, or email. We will determine feasibility and quote pricing based on your drawings and specifications. Any changes in dimensions and/or design must be made in writing and may incur additional charges. All custom orders require a 50% deposit. This deposit is non-refundable once the order has been processed. Sun Valley Bronze retains all ownership rights to custom designs and samples unless otherwise agreed upon in writing.